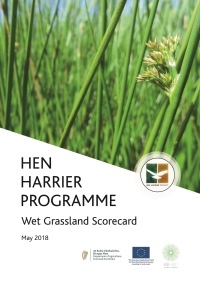 The Hen Harrier Programme is administered by the Hen Harrier Project Ltd. This guide provides information on how to apply to the Programme and a summary of the selection criteria. 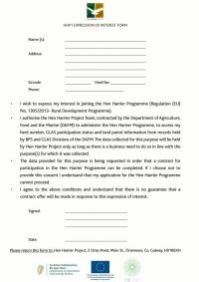 The farmer will apply to the Programme by submitting an Expression of Interest Form. This is a single page form requesting name, address, telephone and herd number. 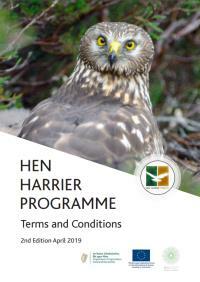 The submission of this form authorises the Hen Harrier Project Team to access the applicants Basic Payment Scheme details and maps. 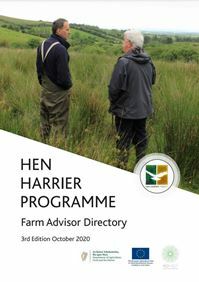 The participating farmer is free to select an Advisor from this list of approved Hen Harrier Farm Advisors. All advisory costs are borne by the participant. The Hen Harrier Project is not responsible for the actions of Advisors. 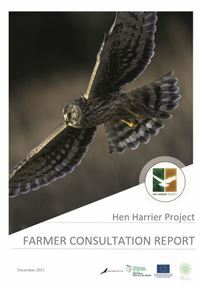 Consultations with farmers were a key part of the development process for the Hen Harrier Programme in 2017. 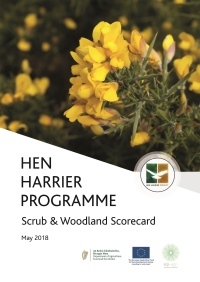 This document summarises the issues raised in the consultation phase and how they contributed to the design of the Programme and how the questions asked would now be answered in the Hen Harrier Programme. 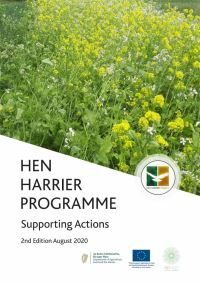 the Hen Harrier Programme will co-fund the delivery of actions that directly support Hen Harriers or their prey or enable farmers to improve habitats through management. Actions are voluntary and participants are not obliged to avail of this support. 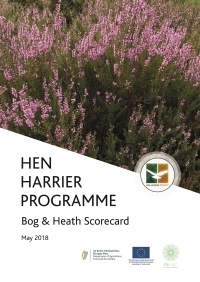 This report provides an overview of the breeding Hen Harrier population in the SPA Network in 2018. 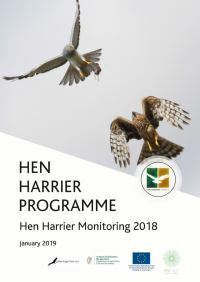 In 2017, extensive monitoring of breeding Hen Harrier was carried out across all the SPAs in Ireland by experts from the Golden Eagle Trust Monitoring Team. Monitoring will be undertaken in each year of the Programme. 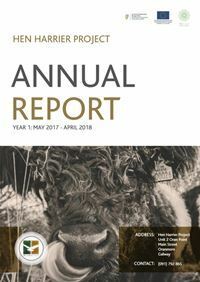 This report provides an overview of the breeding Hen Harrier population in the SPA Network in 2017. Wet grassland can be found on flat or sloping ground in upland and lowland areas. It occurs on wet or waterlogged mineral or organic soils that are poorly-drained. Wet grassland often contains abundant cover of rushes. Peatland habitats are also very common throughout the SPAs.There are two main types of peatland that are commonly farmed: Heath - this may be wet or dry heath; and, blanket bog - this may be upland or lowland blanket bog. Patches of woods and scrub are very common on Irish farms. Gorse (furze), Whitethorn, Willow and Blackthorn are commons scrub species in the SPAs. This scrub can be very important hunting grounds for Hen Harrier and may be nesting sites also. 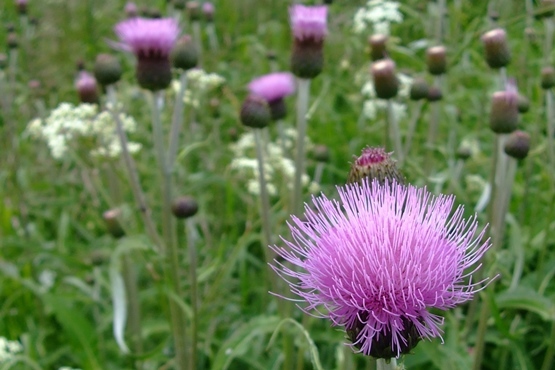 Species-rich grasslands are usually found on land that has had little or no exposure to lime, fertiliser and herbicide inputs for at least 10 years. Species-rich grasslands support a wide range of flowering plants, along with pollinating bees, butterflies, moths and other invertebrates. 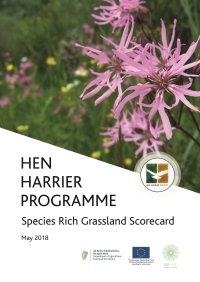 This is a field identification guide for farmers and farm planners taking part in the Hen Harrier Programme. The guide illustrates each of the positive and negative plant indicators relevant to the scorecard and describes how to identify them in the field. This includes a description of flowers and leaves, flowering time, and other useful or interesting facts that help to give an identity to the plants. 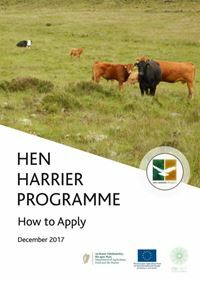 To help us develop optimal supports for farmers the Hen Harrier Project is running a demonstration project on selected farms over the next two years. 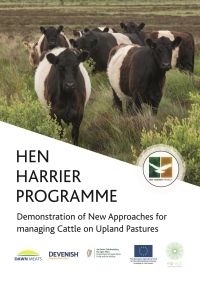 In this demonstration the participating farmer, the Hen Harrier Project, Devenish Nutrition and Dawn Meats will work towards unlocking the potential of cattle grazing in the uplands. 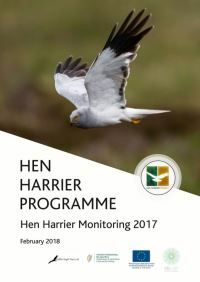 This report provides a summary of the Hen Harrier Project's activities in our first year of development and operation.